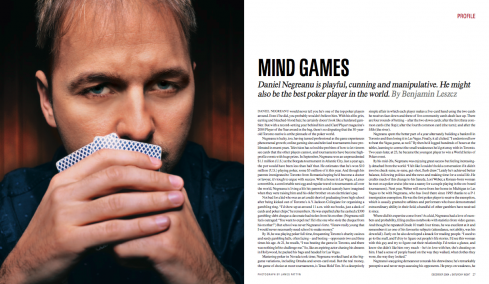 Daniel Negreanu would never tell you he’s one of the top poker players around. Even if he did, you probably wouldn’t believe him. With his elfin grin, earring and bleached-blond hair, he certainly doesn’t look like a hardened gambler. But with a record-setting year behind him and Card Player magazine’s 2004 Player of the Year award in the bag, there’s no disputing that the 30-year-old Toronto native is at the pinnacle of the poker world. Negreanu is lucky, too, having turned professional as the game experiences phenomenal growth; online gaming sites and televised tournaments have proliferated in recentyears. Television has solved the problem of how to let viewers see cards that the other players cannot, and tournaments have become high-profile events with huge prizes. In September, Negreanu won an unprecedented $1.1 million (U.S.) at the Borgata tournament in Atlantic City. Just a year ago, the pot would have been less than half that. He estimates that he’s won $10 million (U.S.) playing poker, some $3 million of it this year. And though his parents immigrated to Toronto from Romania hoping he’d become a doctor or lawyer, it’s tough to argue with success. With a house in Las Vegas, a Lexus convertible, a comfortable nest egg and regular travel to tournaments all over the world, Negreanu is living a life his parents could scarcely have imagined when they were raising him and his older brother on an electrician’s pay. By 18, he was playing poker full-time, frequenting Toronto’s charity casinos and seedy gambling halls, often facing — and besting — opponents two and three times his age. At 21, he recalls, “I was beating the game in Toronto, and there was nothing left to challenge me.” So, like an aspiring actor chasing his dreams in Hollywood, he packed his bags and headed for Las Vegas. Mastering poker in Nevada took time; Negreanu worked hard at the big-game variations, including Omaha and seven-card stud. But the real money, the game of choice at most tournaments, is Texas Hold ’Em. It’s a deceptively simple affair in which each player makes a five-card hand using the two cards he receives face down and three of five community cards dealt face up. There are four rounds of betting — after the two down cards; after the first three common cards (the flop); after the fourth common card (the turn); and after the fifth (the river). Negreanu spent the better part of a year alternately building a bankroll in Toronto and then losing it in Las Vegas. Finally, it all clicked. “I understood how to beat the Vegas game, as well.” By then he’d logged hundreds of hours at the tables, learning to correct the small weaknesses he’d got away with in Toronto. Two years later, at 23, he became the youngest player to win a World Series of Poker event. By his mid-20s, Negreanu was enjoying great success but feeling increasingly detached from the world. “I felt like I couldn’t hold a conversation if it didn’t involve check-raise, re-raise, gut-shot, flush draw.” Lately he’s achieved better balance, following politics and the news and making time for a social life. He credits much of this change to his fiancée, Lori Weber, a Korean-born woman he met on a poker cruise (she was a nanny for a couple playing in the on-board tournament). Next year, Weber will move from her home in Michigan to Las Vegas to be with Negreanu, who has lived there since 1995 thanks to a P-1 immigration exemption. He was the first poker player to receive the exemption, which is usually granted to athletes and performers who have demonstrated extraordinary ability in their field; a handful of other gamblers have received it since. Nor does Negreanu rely on tells, the twitch or nervous laugh that can give amateur players’ hands away. Such signs, he says, are overrated, and rarely exist at the professional level. Rather, “I look for a person’s character. Is he weak? Can I bully him or not? Will he challenge me? Is he an honest person or a scoundrel? I go back to our betting history and I play past hands in my head. I also — this is very important — figure out what his impression of me is. What does he think I have?” His ability to answer these questions helps explain his success at betting — often heart-stopping sums — that he can deduce your down cards better than you can deduce his. Fifteen minutes into our interview, before a deck of cards has appeared, Negreanu has me pegged: “Your approach would be very conservative. You’d try to make the right mathematical decisions. You’re the type of guy I’d probably try to push around, to be honest.” Later, as we play Texas Hold ’Em, his words stay with me. The first hand, he bets as if bluffing, responding to my weak bets with large raises. I fight back, calling even though my down cards are weak. I’m certain he’s trying to push me around. Sure enough, he beats me, laying down the low straight I thought he was only pretending to have. “I figured,” he says, “because of what I told you earlier, that you might think I was pushing you around.” Throughout our mini-tournament he stays a step ahead of me; I don’t win a single hand. As he rakes in one of the bigger pots, he explains, “This is what I do. I planted that seed to get you to fold. Earlier, I planted a seed to get you to call.” No-Limit Hold’Em is a game of mathematics and money management, but even more it’s a game of nerve, deception and manipulation.